The record books will simply reduce Saturday afternoon into a tally in the loss column for the Colonials. But that mark won’t show that the team fought back from a double-digit deficit. It won’t show that a Colonial squad paced by four freshmen took No. 14 Butler to the wire in front of a screaming, sold-out Smith Center. It won’t show the final scramble for a shot in a three-point game. Instead, it will show that GW fell 59-56 to the Bulldogs, and that makes the loss all the more painful. “I think we still wanted to get the W. It still was a blow to us. But it shows that if we play hard from the get-go, rather than when we get down 17, we can win. We can compete,” freshman guard Joe McDonald said. 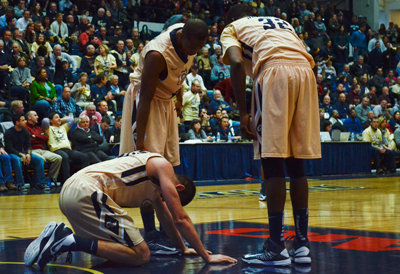 Colonials react to the final-seconds loss. coming off the game, with Butler up by 17 points courtesy of explosive senior guard Rotnei Clarke. GW wasn’t about to buckle under pressure, though. Playing an aggressive man-to-man defense all afternoon, the team began to press heavily, bearing down on the Bulldogs in transition. Butler began to crack, tiny fissures that first appeared as a bobbled pass here, a step out of bounds there. Slowly, the Colonials chipped away at the Bulldog lead. The fury and tempo of the game built, as player after player hit the deck to force jump balls, until – with just 52 seconds left – GW was only down by three. Though the final possession would end without the Colonials wholly making up their deficit, the push back against Butler’s lead was a dramatic improvement from the way GW opened play. Neither team shot particularly well before the break. The Bulldogs shot only 37.1 percent in the first half, and the Colonials just 24.2 percent. But Butler converted three treys, compared to GW’s zero. The Bulldogs were more clearly in the game on the boards, gathering a 30-19 first-half rebound advantage that gave them the edge over the first twenty minutes of play. Entering halftime in that hole gave the Colonials an impetus to fight. Faced with a deep Butler offensive attack that rotated through various shooters, the Colonials were determined to answer defensively. Prior to Saturday’s game, both Lonergan and senior guard Lasan Kromah said the team’s strong points were its rebounding and defense, and GW came into the second half determined to showcase its strengths. Switching into the press, the Colonials closed the rebounding gap, finishing only five behind Butler’s 46. 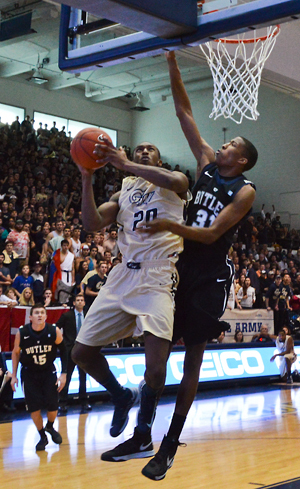 The press suffocated the usually methodical Butler offense to the tune of 19 forced turnovers. It was, in the end, shooting that would prove the Colonials’ downfall. Faced with a Butler defense that focused on spreading GW out and getting players off their marks, the team turned in one of its worst shooting performances of the season. Shot after shot didn’t fall, and the Colonials ended shooting just 27.9 percent on the game. Further frustrating matters was GW’s 1-for-12 line from three-point range. Though Armwood recorded his second straight double-double, with 14 points and 11 boards, and McDonald and Kromah added 10 points apiece, the shooting just wasn’t there. Still, shooting struggles aside, the 17-point deficit aside, the loss aside, GW’s head coach knows that today is more than a tally in the defeat column. “I’m proud of our guys, I have no problem saying that. That’s a heck of a team, a heck of a coach, and it’s a hell of a league,” Lonergan said.